Click the button below to add the Bio-Curcumin to your wish list. Curcumin is impressing scientists around the world with its remarkable multiple health benefits. Curcumin is a polyphenol present in the spice turmeric and was first used by Indians over 3,000 years ago in traditional Ayurvedic medicine. Modern science has found that curcumin has remarkable antioxidative, immunomodulatory, proapoptotic, hepatoprotective and antiangiogenic properties. Curcumin is also found to increase detoxifying enzymes and promote healthy DNA function. Studies have tied inflammation to overexpression of a protein molecule called nuclear factor-kappa B (NF-kappaB). NF-kappaB acts like a switch to turn on genes that produce the body’s inflammatory responses. Turmeric has a peppery, warm and bitter flavor and a mild fragrance slightly reminiscent of orange and ginger, and while it is best known as one of the ingredients used to make curry, it also gives ballpark mustard its bright yellow color. Turmeric comes from the root of the Curcuma longa plant and has a tough brown skin and a deep orange flesh. Turmeric has long been used as a powerful anti-inflammatory in both the Chinese and Indian systems of medicine. Turmeric was traditionally called "Indian saffron" because of its deep yellow-orange color and has been used throughout history as a condiment, healing remedy and textile dye. The volatile oil fraction of turmeric has demonstrated significant anti-inflammatory activity in a variety of experimental models. Even more potent than its volatile oil is the yellow or orange pigment of turmeric, which is calledcurcumin. Curcumin is thought to be the primary pharmacological agent in turmeric. In numerous studies, curcumin's anti-inflammatory effects have been shown to be comparable to the potent drugs hydrocortisone and phenylbutazone as well as over-the-counter anti-inflammatory agents such as Motrin. Unlike the drugs, which are associated with significant toxic effects (ulcer formation, decreased white blood cell count, intestinal bleeding), curcumin produces no toxicity. Curcumin may provide an inexpensive, well-tolerated, and effective treatment for inflammatory bowel disease (IBD) such as Crohn's and ulcerative colitis, recent research suggests. In this study, mice given an inflammatory agent that normally induces colitis were protected when curcumin was added to their diet five days beforehand. The mice receiving curcumin not only lost much less weight than the control animals, but when researchers checked their intestinal cell function, all the signs typical of colitis (mucosal ulceration, thickening of the intestinal wall, and the infiltration of inflammatory cells)were all much reduced. While the researchers are not yet sure exactly how curcumin achieves its protective effects, they think its benefits are the result of not only antioxidant activity, but also inhibition of a major cellular inflammatory agent called NF kappa-B. Plus, an important part of the good news reported in this study is the fact that although curcumin has been found to be safe at very large doses, this component of turmeric was effective at a concentration as low as 0.25 per cent—an amount easily supplied by simply enjoying turmeric in flavorful curries. Clinical studies have substantiated that curcumin also exerts very powerful antioxidant effects. As an antioxidant, curcumin is able to neutralize free radicals, chemicals that can travel through the body and cause great amounts of damage to healthy cells and cell membranes. This is important in many diseases, such as arthritis, where free radicals are responsible for the painful joint inflammation and eventual damage to the joints. Turmeric's combination of antioxidant and anti-inflammatory effects explains why many people with joint disease find relief when they use the spice regularly. In a recent study of patients with rheumatoid arthritis, curcumin was compared to phenylbutazone and produced comparable improvements in shortened duration of morning stiffness, lengthened walking time, and reduced joint swelling. Curcumin, the major constituent of turmeric that gives the spice its yellow color, can correct the most common expression of the genetic defect that is responsible for cystic fibrosis, suggests an animal study published in the Science(April 2004). Cystic fibrosis, a fatal disease that attacks the lungs with a thick mucus, causing life-threatening infections, afflicts about 30,000 American children and young adults, who rarely survive beyond 30 years of age. The mucus also damages the pancreas, thus interfering with the body's ability to digest and absorb nutrients. Researchers now know that cystic fibrosis is caused by mutations in the gene that encodes for a protein (the transmembrane conductance regulator or CFTR). The CTFR protein is responsible for traveling to the cell's surface and creating channels through which chloride ions can leave the cell. When the protein is abnormally shaped because of a faulty gene, this cannot happen, so chloride builds up in the cells, which in turn, leads to mucus production. The most common mutation, which is called DeltaF508, results in the production of a misfolded protein. When mice with this DeltaF508 defect were given curcumin in doses that, on a weight-per-weight basis, would be well-tolerated by humans, curcumin corrected this defect, resulting in a DeltaF508 protein with normal appearance and function. In addition, the Yale scientists studying curcumin have shown that it can inhibit the release of calcium, thus allowing mutated CTFR to exit cells via the calcium channels, which also helps stop the chloride-driven build up of mucus. Specialists in the treatment of cystic fibrosis caution, however, that patients should not self-medicate with dietary supplements containing curcumin, until the correct doses are known and any adverse interactions identified with the numerous prescription drugs taken by cystic fibrosis sufferers. Curcumin's antioxidant actions enable it to protect the colon cells from free radicals that can damage cellular DNAâ? "a significant benefit particularly in the colon where cell turnover is quite rapid, occuring approximately every three days. Because of their frequent replication, mutations in the DNA of colon cells can result in the formation of cancerous cells much more quickly. Curcumin also helps the body to destroy mutated cancer cells, so they cannot spread through the body and cause more harm. A primary way in which curcumin does so is by enhancing liver function. Additionally, other suggested mechanisms by which it may protect against cancer development include inhibiting the synthesis of a protein thought to be instrumental in tumor formation and preventing the development of additional blood supply necessary for cancer cell growth. Epidemiological studies have linked the frequent use of turmeric to lower rates of breast, prostate, lung and colon cancer; laboratory experiments have shown curcumin can prevent tumors from forming; and research conducted at the University of Texas suggests that even when breast cancer is already present, curcumin can help slow the spread of breast cancer cells to the lungs in mice. In this study, published in Biochemical Pharmacology (September 2005), human breast cancer cells were injected into mice, and the resulting tumors removed to simulate a mastectomy. The mice were then divided into four groups. One group received no further treatment and served as a control. A second group was given the cancer drug paclitaxel (Taxol); the third got curcumin, and the fourth was given both Taxol and curcumin. After five weeks, only half the mice in the curcumin-only group and just 22% of those in the curcumin plus Taxol group had evidence of breast cancer that had spread to the lungs. But 75% of the mice that got Taxol alone and 95% of the control group developed lung tumours. How did curcumin help? "Curcumin acts against transcription factors, which are like a master switch," said lead researcher, Bharat Aggarwal. "Transcription factors regulate all the genes needed for tumors to form. When we turn them off, we shut down some genes that are involved in the growth and invasion of cancer cells." In another laboratory study of human non-Hodgkin's lymphoma cells published in Biochemical Pharmacology (September 2005), University of Texas researchers showed that curcumin inhibits the activation of NF-kappaB, a regulatory molecule that signals genes to produce a slew of inflammatory molecules (including TNF, COX-2 and IL-6) that promote cancer cell growth. In addition, curcumin was found to suppress cancer cell proliferation and to induce cell cycle arrest and apoptosis (cell suicide) in the lung cancer cells. Early phase I clinical trials at the University of Texas are now also looking into curcumin's chemopreventive and therapeutic properties against multiple myeloma and pancreatic cancer, and other research groups are investigating curcumin's ability to prevent oral cancer. Curcumin, a phytonutrient found in the curry spice turmeric, and quercitin, an antioxidant in onions, reduce both the size and number of precancerous lesions in the human intestinal tract, shows research published in the August 2006 issue ofClinical Gasteroenterology and Hepatology. Each patient received curcumin (480 mg) and quercetin (20 mg) orally 3 times a day for 6 months. Although the amount of quercetin was similar to what many people consume daily, the curcumin consumed was more than would be provided in a typical diet because turmeric only contains on average 3-5 % curcumin by weight. While simply consuming curry and onions may not have as dramatic an effect as was produced in this study, this research clearly demonstrates that liberal use of turmeric and onions can play a protective role against the development of colorectal cancer. And turmeric doesn't have to only be used in curries. This spice is delicious on healthy sautéed apples, and healthy steamed cauliflower and/or green beans and onions. Or, for a flavor-rich, low-calorie dip, try adding some turmeric and dried onion to creamy yogurt. Prostate cancer—the second leading cause of cancer death in American men with 500,000 new cases appearing each year—is a rare occurrence among men in India, whose low risk is attributed to a diet rich in brassica family vegetables and the curry spice, turmeric. Scientists tested turmeric, a concentrated source of the phytonutrient curcumin, along with phenethyl isothiocyanates, a phytochemical abundant in cruciferous vegetables including cauliflower, cabbage, broccoli, Brussels sprouts, kale, kohlrabi and turnips. When tested singly, both phenethyl isothiocyanate and curcumin greatly retarded the growth of human prostate cancer cells implanted in immune-deficient mice. In mice with well-established prostate cancer tumors, neither phenethyl isothiocyanate nor curcumin by itself had a protective effect, but when combined, they significantly reduced both tumor growth and the ability of the prostate cancer cells to spread (metastasize) in the test animals. The researchers believe the combination of cruciferous vegetables and curcumin could be an effective therapy not only to prevent prostate cancer, but to inhibit the spread of established prostate cancers. Best of all, this combination—cauliflower spiced with turmeric—is absolutely delicious! For protection against prostate cancer, cut cauliflower florets in quarters and let sit for 5-10 minutes; this allows time for the production of phenethyl isothiocyanates, which form when cruciferous vegetables are cut, but stops when they are heated. Then sprinkle with turmeric, and healthy sauté on medium heat in a few tablespoons of vegetable or chicken broth for 5 minutes. Remove from the heat and top with olive oil, sea salt and pepper to taste. Research presented at a recent conference on childhood leukemia, held in London, provides evidence that eating foods spiced with turmeric could reduce the risk of developing childhood leukemia. The incidence of this cancer has risen dramatically during the 20th century, mainly in children under age five, among whom the risk has increased by more than 50% cent since 1950 alone. Modern environmental and lifestyle factors are thought to play a major role in this increase. Childhood leukemia is much lower in Asia than Western countries, which may be due to differences in diet, one of which, the frequent use of turmeric, has been investigated in a series of studies over the last 20 years by Prof. Moolky Nagabhushan from the Loyola University Medical Centre, Chicago, IL. "Some of the known risk factors that contribute to the high incidence of childhood leukemia are the interaction of many lifestyle and environmental factors. These include prenatal or postnatal exposure to radiation, benzene, environmental pollutants and alkylating chemotherapeutic drugs. Our studies show that turmeric—and its colouring principle, curcumin—in the diet mitigate the effects of some of these risk factors." In a recent rat study conducted to evaluate the effects of turmeric on the liver's ability to detoxify xenobiotic (toxic) chemicals, levels of two very important liver detoxification enzymes (UDP glucuronyl transferase and glutathione-S-transferase) were significantly elevated in rats fed turmeric as compared to controls. The researchers commented, "The results suggest that turmeric may increase detoxification systems in addition to its anti-oxidant properties...Turmeric used widely as a spice would probably mitigate the effects of several dietary carcinogens." Curcumin has been shown to prevent colon cancer in rodent studies. When researchers set up a study to analyze how curcumin works, they found that it inhibits free radical damage of fats (such as those found in cell membranes and cholesterol), prevents the formation of the inflammatory chemical cyclooxygenase-2 (COX-2), and induces the formation of a primary liver detoxification enzyme, glutathione S-transferase (GST) enzymes. When the rats were given curcumin for 14 days, their livers' production of GST increased by 16%, and a marker of free radical damage called malondialdehyde decreased by 36% when compared with controls. During this two week period, the researchers gave the rats a cancer-causing chemical called carbon tetrachloride. In the rats not fed curcumin, markers of free radical damage to colon cells went up, but in the rats given turmeric, this increase was prevented by dietary curcumin. 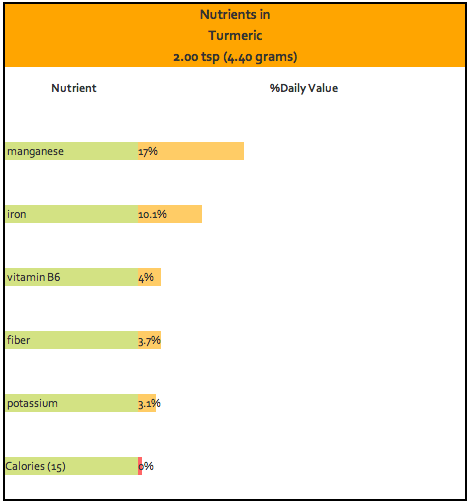 Lastly, the researchers compared giving turmeric in the diet versus injecting curcumin into the rats' colons. They found injecting curcumin resulted in more curcumin in the blood, but much less in the colon mucosa. They concluded, "The results show that curcumin mixed with the diet achieves drug levels in the colon and liver sufficient to explain the pharmacological activities observed and suggest that this mode of administration may be preferable for the chemoprevention of colon cancer." Curcumin may be able to prevent the oxidation of cholesterol in the body. Since oxidized cholesterol is what damages blood vessels and builds up in the plaques that can lead to heart attack or stroke, preventing the oxidation of new cholesterol may help to reduce the progression of atherosclerosis and diabetic heart disease. In addition, turmeric is a good source of vitamin B6, which is needed to keep homocysteine levels from getting too high. Homocysteine, an intermediate product of an important cellular process called methylation, is directly damaging to blood vessel walls. High levels of homocysteine are considered a significant risk factor for blood vessel damage, atherosclerotic plaque build-up, and heart disease; while a high intake of vitamin B6 is associated with a reduced risk of heart disease. In research published in the Indian Journal of Physiology and Pharmacology, when 10 healthy volunteers consumed 500 mg of curcumin per day for 7 days, not only did their blood levels of oxidized cholesterol drop by 33%, but their total cholesterol droped 11.63% , and their HDL (good cholesterol) increased by 29%! (Soni KB, Kuttan R). Tumeric's cholesterol-lowering effects are the result of the curry spice's active constituent, curcumin, which research reveals is a messaging molecule that communicates with genes in liver cells, directing them to increase the production of mRNA (messenger proteins) that direct the creation of receptors for LDL (bad) cholesterol. With more LDL-receptors, liver cells are able to clear more LDL-cholesterol from the body. Growing evidence suggests that turmeric may afford protection against neurodegenerative diseases. Epidemiological studies show that in elderly Indian populations, among whose diet turmeric is a common spice, levels of neurological diseases such as Alzheimer's are very low. Concurrently, experimental research conducted recently found that curcumin does appear to slow the progression of Alzheimer's in mice. Preliminary studies in mice also suggest that curcumin may block the progression of multiple sclerosis. While it is still unclear how it may afford protection against this degenerative condition, one theory is that it may interrupt the production of IL-2, a protein that can play a key role in the destruction of myelin, the sheath that serves to protect most nerves in the body. A number of studies have suggested that curcumin, the biologically active constituent in turmeric, protects against Alzheimer's disease by turning on a gene that codes for the production of antioxidant proteins. A study published in the Italian Journal of Biochemistry (December 2003) discussed curcumin's role in the induction of the the heme oxygenase pathway, a protective system that, when triggered in brain tissue, causes the production of the potent antioxidant bilirubin, which protects the brain against oxidative (free radical) injury. Such oxidation is thought to be a major factor in aging and to be responsible for neurodegenerative disorders including dementias like Alzheimer's disease. Another study conducted jointly by an Italian and U.S. team and presented at the American Physiological Society's 2004 annual conference in Washington, DC, confirmed that curcumin strongly induces expression of the gene, called hemeoxygenase-1 (HO-1) in astrocytes from the hippocampal region of the brain. Research conducted at UCLA and published in the Journal of Biological Chemistry(December 2004), which has been confirmed by further research published in theJournal of Agricultural and Food Chemistry (April 2006), provides insight into the mechanisms behind curcumin's protective effects against Alzheimer's disease. Alzheimer's disease results when a protein fragment called amyloid-B accumulates in brain cells, producing oxidative stress and inflammation, and forming plaques between nerve cells (neurons) in the brain that disrupt brain function. Amyloid is a general term for protein fragments that the body produces normally. Amyloid-B is a protein fragment snipped from another protein called amyloid precursor protein (APP). In a healthy brain, these protein fragments are broken down and eliminated. In Alzheimer's disease, the fragments accumulate, forming hard, insoluble plaques between brain cells. The UCLA researchers first conducted test tube studies in which curcumin was shown to inhibit amyloid-B aggregation and to dissolve amyloid fibrils more effectively than the anti-inflammatory drugs ibuprofen and naproxen. Then, using live mice, the researchers found that curcumin crosses the blood brain barrier and binds to small amyloid-B species. Once bound to curcumin, the amyloid-B protein fragments can no longer clump together to form plaques. Curcumin not only binds to amyloid-B, but also has anti-inflammatory and antioxidant properties, supplying additional protection to brain cells. The most active ingredient in turmeric root, bisdemethoxycurcumin, boosts the activity of the immune system in Alzheimer's patients, helping them to clear the amyloid beta plaques characteristic of the disease. Turmeric was traditionally called Indian saffron since its deep yellow-orange color is similar to that of the prized saffron. It has been used throughout history as a condiment, healing remedy and textile dye. Turmeric is native to Indonesia and southern India, where it has been harvested for more than 5,000 years. It has served an important role in many traditional cultures throughout the East, including being a revered member of the Ayurvedic pharmacopeia. While Arab traders introduced it into Europe in the 13th century, it has only recently become popular in Western cultures. Much of its recent popularity is owed to the recent research that has highlighted its therapeutic properties. The leading commercial producers of turmeric include India, Indonesia, China, the Philippines, Taiwan, Haiti and Jamaica.